The first round of polling took place on Sunday 7 October and saw far right candidate Bolsonaro win 46% of the vote – a proportion of the vote significantly higher than what Brazil’s main opinion polling companies predicted. The final round of the election will take place on Sunday 28 October. The Workers Party candidate Haddad has made it through to the final round with 29.3% of the vote despite the US and the Brazilian right wing’s relentless campaign to persecute the Workers Party and its leadership, Lula and Rousseff, over the past two years. The right wing has used every undemocratic trick in the book to stop the left winning this Presidential election. The latest blow came just 11 days before polling day when the Federal Supreme Court ruled that 3.3 million registered voters, concentrated in areas where support for the left is strong in the North East of the country, would not be allowed to participate in the election. 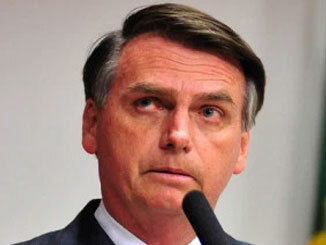 Whilst polling from Brazil’s two leading poll companies, Ibope and Datafolha, indicate that the future of Brazil hangs in the balance with the far right and progressive left currently neck and neck in the final round, both companies vastly under-estimated the level of support for Bolsonaro ahead of Sunday’s first round so such predictions are unreliable. Bolsonaro therefore has a very strong chance of victory in the second round. His programme for government includes a harsh neo-liberal economic policy that will fail to restore growth, attack living standards and therefore be extremely unpopular with Brazil’s huge working class. A similar programme of right wing economic reforms in Argentina has damaged President Macri’s approval ratings and the left is mounting huge protests and struggles against the government. Maximising the left’s vote in the second round of Brazil’s Presidential election is crucial to prepare for the social struggles to come should Bolsonaro win the Presidency. At the same time Bolsonaro has clearly indicated his preparedness to deploy repression to suppress political opponents – the left in Brazil will require huge support and international solidarity if he wins. The outcome of this election is of great importance for the people of Brazil, Latin America, and for the left internationally. Brazil is home to over 200 million people, has the largest economy on the continent and the ‘lungs of the planet’ in the form of the Amazon rainforest. In addition to the direct, very severe attacks on the Brazilian people’s economic and social conditions, and democratic rights, which Bolsonaro would implement, he has also threatened to pull Brazil out of the Paris Climate Change Accord and open up the rainforest to agro-business. Such a move would be catastrophic and demonstrates the danger that the new rise of the far right internationally poses to humanity’s future. The US and Brazilian bourgeoisie’s have waged a campaign with the goal of eliminating the Workers Party as a serious force in this year’s Presidential election, and to pave the way for the main centre-right political party in Brazil, the Social Democracy Party (PSDB), to sweep in and return to power. But Sunday’s result show that this election did not go to plan. As Brazilian politics has polarised in response to the economic crisis, the PSDB traditional party of big business has been removed as a serious force. Their candidate Geraldo Alckim, secured only 4.8% of the vote. This is the lowest vote that the PSDB has received in its 30 years of existence – dropping from the 33.5% that the party’s Presidential candidate secured in 2014. Instead, the centre right has been replaced by a resurgent far right. Jair Bolsonaro has nostalgia for Brazil’s dictatorship, has insulted women, Black and gay people and is proposing wide ranging privatisation and attacks on the population. His program includes a brutal approach to law and order as well as a pledge to withdraw from the Paris Climate Change Agreement and open up the Amazon rainforest to agro-business. In the lead up to the first round of the election hundreds of thousands of women took to the streets in cities across Brazil as part of the ‘Women United Against Bolsonaro’ movement with a clear message: #NotHim. With their own candidates lacking any serious support, forces from the centre right of Brazilian politics have been getting behind Bolsonaro in the run up to the first round vote. In the week preceding the first round of the election the centre-right Mayor of Sao Paulo Joao Doria of the PSDB came out in support of Bolsonaro rather than his party’s own candidate Geraldo Ackmin. Brazil’s third-largest party in the House and the Senate, the ‘Democrats’, also decided to back Bolsonaro. This indicates that the priority of pro bourgeois forces is to stop the progressive left, even if this means backing an extreme right wing candidate. Meanwhile, the Workers Party has secured its place in the final round of the Presidential election. This has been achieved despite the relentless campaign of destabilisation, including a Parliamentary coup, the political persecution of its leaders and the removal the party’s preferred candidate, Lula, from the running by trumped up charges. Throughout the past year Lula, as the Workers Party Presidential candidate, has been ahead of all rivals in the opinion polls – which all showed that he would decisively defeat Bolsonaro who was polling as a distant second for many months. That is why Brazil’s courts moved to convict Lula on corruption charges and sentenced him to 12 years in prison earlier this year. This decision to effectively disqualify Lula and exclude him from the ballot paper represents an attempt to rig the election and consolidate the soft coup in Brazil which started with the ousting of democratically elected, left-wing President Rousseff in 2016. With just weeks to go until polling day, the Workers Party was forced to swap their candidate from Lula to Haddad which depressed the left’s vote significantly as Lula was polling round 35-37% at the time he withdrew from the race in early September. Not content with preventing Brazil’s most popular politician from running, 11 days before the first round vote, the Federal Supreme Court upheld a ruling to exclude 3.3 million registered voters from participating in the election. This represents 2% of the entire electorate. This is another example of the relentless campaign waged against the left by Brazil’s unelected, conservative judiciary which is controlled by the right and the US. Bolsonaro’s economic policy would further exacerbate the economic crisis that is currently engulfing Brazil. He plans to unleash severe austerity policies and neoliberal reforms that would degrade the living standards of the population further and fail to restore growth. The current economic crisis in Brazil started four years ago when the left was in government. The Workers Party pursued redistributive policies that over a decade brought millions of people out of poverty. However, the left did not use this period of prosperity to make economic changes to protect growth in the event of a global slowdown. There was no ‘revolution in production’, so when commodity prices fell in 2014, Brazil’s economy went into crisis and dramatically slowed. The Workers Party government implemented austerity policies that further cut growth. This was the backdrop that made it possible for Dilma Rousseff to be ousted in a Parliamentary coup due to rising discontent amongst the population whose living standards were being hit. In China and Vietnam the left have created the most rapidly growing economies, with the fastest rise in living standards, and greatest reduction in poverty, of any countries. This was achieved by pursuing a ‘revolution in production’ – a massive expansion of state investment in the economy, with this programme boosted in the wake of the financial and commodity prices crash. If the Workers Party re-gains office in Brazil, carrying out a programme of sustainable investment to grow the economy and create the resources to raise living standards will be essential to stabilise the political situation and consolidate support for the left. The stakes within Brazil are huge. A victory for Bolsonaro would represent a consolidation of the US-sponsored soft coup against the left and empower a far right to pursue a harsh neo-liberal economic programme alongside a vicious and violent campaign of internal repression under the guise of ‘law and order.’ A hard right regime in Brazil would greatly assist Trump’s interventions against the left across the region. A win for the Haddad in the second round would be an enormous victory for the people of Brazil. It would also provide a significant boost to the left throughout the region – including the left governments in Mexico, Cuba, Venezuela, Bolivia and Nicaragua and the left opposition involved in large struggles against right wing governments in Argentina, Costa Rica, Ecuador and elsewhere. Lula remains the leader of Brazil’s left – he is a political prisoner who has been blocked from contesting this Presidential election by a conservative judiciary that is politically hostile to the left. The campaign to free Lula – which has gained significant international support including amongst US Senators such as Bernie Sanders and from the British Trade Union Congress – must be stepped up. The left internationally should have no hesitation in supporting the left in the second round of voting on Sunday 28 October. A victory to the Workers Party’s Haddad and his running mate Manuela D’Avila, the Communist Party of Brazil’s (PCdoB) candidate for Vice President, would be a victory for the left internationally.